Harvard will have nine athletes—eight alumni, a current student—and one varsity coach (plus one coaching alumnus) at the 2012 Olympic Games in London, which begin on Friday, July 27. There's even a Harvard-educated doctor with the team. The Ulen-Brooks endowed coach for Harvard men's swimming and diving, Tim Murphy, will be head coach for the U.S. open-water swim team, and is blogging about his Olympic experiences. In the Olympic Village, he will join some stellar Crimson athletes: six rowers, one basketball player, a swimmer, and a track and field (known in Olympic parlance as "athletics") competitor. 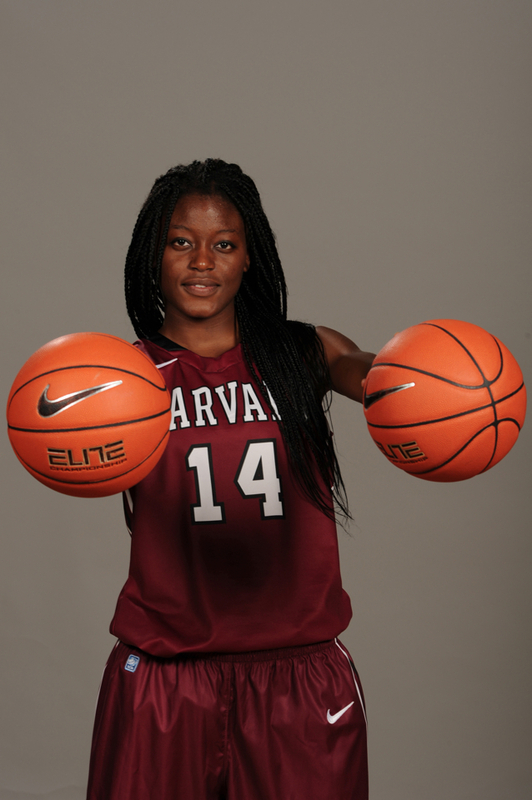 The undergraduate Olympian, Temi Fagbenle ’15, will compete for Great Britain’s women's basketball team. The six-foot, four-inch forward (who, coincidentally, hails from London), is no stranger to international competition: she led her team to the 2010 Under-18 Women's European Championship, leading the tournament in five statistical categories. The rising sophomore sat out her freshman year ”in residency,” under NCAA rules that involved her expected graduation date from Blair Academy in New Jersey in relation to a standardized test she took in England: she practiced with the Crimson all year, but did not compete or travel. She is only the second women’s basketball Olympian in Ivy League history; she joins Brown’s Martina Jerant, who played for Canada in the 1996 Atlanta Games. Expect to see Fagbenle on the court for Harvard this fall and winter. Samyr Laine ’06, profiled during his college career in Harvard Magazine, will compete for Haiti in the triple jump. He blogs on his website. Former varsity swimmer Alex Meyer ’10 finds himself again under Tim Murphy’s guidance; he was an All-American in the 1650 freestyle in 2010. Meyer will race in the 10K event as an open-water swimmer, the only American male in this event. Open-water competition emphasizes endurance; the shortest event, the 5K, is more than three times longer than any race held in a pool. 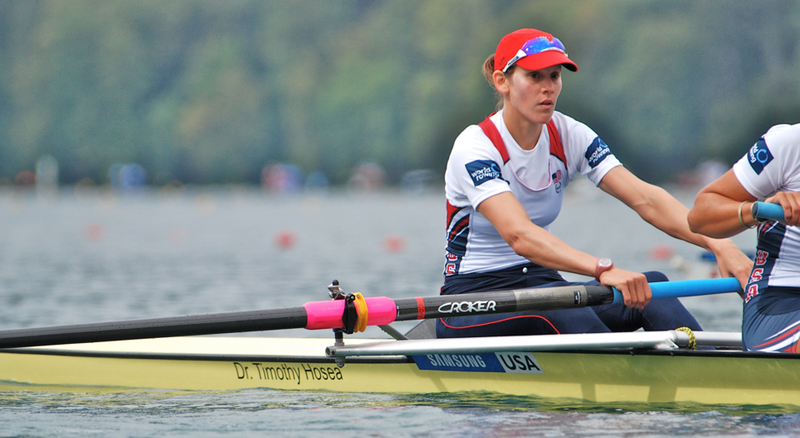 Two alumnae will row in the women’s eight-oared boat that races for the United States. One is Caryn Davies ’05, profiled in Harvard Magazine in 2003, a year after she won her first world championship, in a U.S women’s eight. Davies has added three more gold medals at World Championships since then, plus a silver at the 2004 Athens Olympics and a gold in Beijing in 2008, when she stroked the championship U.S. women’s crew. (All her world championships, except a 2003 title in Milan in a coxed four, have been in eight-oared shells.) Esther Lofgren ’09, recently profiled by The Harvard Crimson, has a burgeoning collection of medals herself; two of the most recent are golds she earned in the U.S. eights at the 2010 and 2011 World Championships. That track record alone should make the U.S. crew a favorite in London. Lofgren’s personal blog, titled “Harder, Better, Faster, Stronger,” will record her Olympic adventures. Four alumni will row in the London Games as well. Will Newell ’11 will be in the U.S. men’s lightweight four, after rowing in the four that won the 2012 Final Olympic Qualification Regatta. Look for Henrik Rummel ’09 in the U.S. four. Rummel, an experienced international competitor, won gold in the pair with coxswain at the 2009 World Championships. 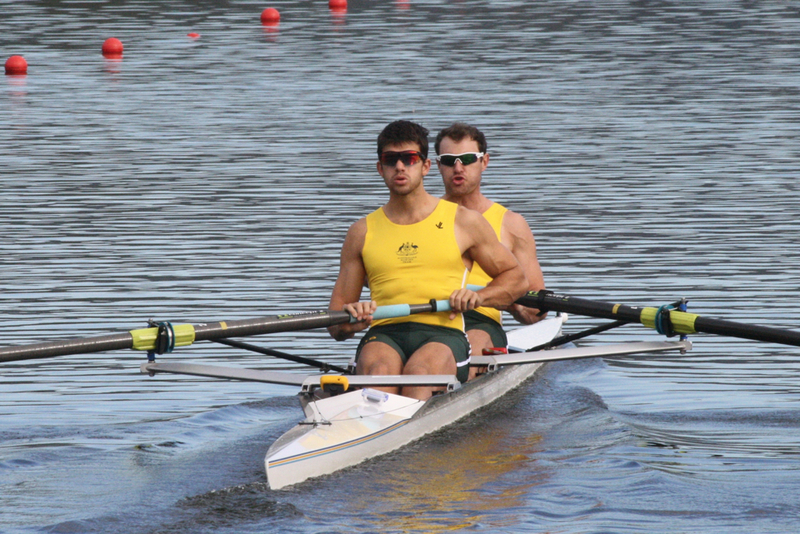 Brodie Buckland ’06 will compete for Australia in the men’s pair, although he rowed for the United States at the 2006 and 2007 World Championships, finishing fourth both times, in the coxed four and the eight, respectively. Malcolm Howard ’05 will be in the Canadian men’s eight. He won a gold medal in that event at the 2008 Beijing Olympics. In addition, R. Gregg Stone ’75 is in London coaching his daughter, Gevvie Stone, the U.S. entry in the women's single sculling event. In 1980, Gregg Stone was the U.S. men's sculler, but President Carter's boycott of the Moscow Games denied him his chance to compete. He has coached Gevvie (a Princeton alumna and a current Tufts medical student) on the Charles River for the past four years; she launches her single from Weld Boathouse. The U. S. rowing squad, and athletes from several other sports, benefit from the attention of Timothy Hosea ’74, M.D. Hosea rowed as a Harvard undergraduate, and has helped the U.S. crews at every Olympic Games since 1984. This post has been updated to reflect R. Gregg Stone's status as coach of his daughter Gevvie, the U. S. women's single sculler in London, and the Olympic participation of Timothy Hosea, M.D. To learn about Harvard’s earliest Olympics competitors, read "The Unexpected Olympians: How Harvard Dominated the First Modern Games—In Spite of Itself," from the Harvard Magazine archives.